Information for this page was obtained from the books "Out of the Blue and Into History", by B. S. Turner and "On Final Approach", by B. H. Granger, and an accident report provided by Craig Fuller. Additional pictures and information were provided by friends and Joyce Secciani. Joyce had always wanted to fly - probably from the day she was born, which was December, 1921, in San Diego, California, where she lives today. She spent all of her school years in El Centro and upon graduating from high school, signed up for the government sponsored Civil Pilot Training program at Central Junior College. Joyce was really serious about flying. She sold her horse and stopped studying piano so she could devote all her energies to flying. After getting her private license, she joined a flying club with 10 members and shared a 65 h.p Interstate plane. After the attack at Pearl Harbor, private flying was not allowed within 200 miles of the U.S. coast. So, with the wings removed and secured along side the fuselage, Joyce helped another member of the club transport the plane on a trailer to Arizona. As soon as she heard about Jacqueline Cochran's program she applied in January, 1943, and headed for Houston, Texas where the training program began. There Joyce joined Lois Brooks, Lois Hollingsworth, Betty Deuser, Emma Coulter, Mabel Rawlinson, Marcia Courtney, Florence Knight and others in class 43-3. There were no military quarters, so they lived in a motor court or what is called a motel today. On May 16, 1943, the trainees flew all the planes from Houston to Avenger Field, Sweetwater, Texas. They joined the rest of class 43-4, which had replaced the last of the male cadets. After graduating in July, 1943, Joyce and several classmates were sent to New Castle Army Air Base, Wilmington, Delaware. They were not there long enough to start flying when the received orders to report to General Hap Arnold's office in Washington, D.C. After a few days of orientation and training, the group was reassigned to Camp Davis (now Fort Davis) as part of the Tow Target Squadron near Wilmington, N.C. They trained and towed targets in front of the firing line for anti-aircraft guns to shoot at. They also flew tracking missions at night so the artillery could practice spotting planes with searchlights. Unfortunately, classmate Mabel Rawlinson was killed when the engine failed in her Douglas A-24 and she crashed in the woods. Just two days later, Joyce also had engine failure in an A-24. According to the Army accident report, Joyce and the instructor managed a belly landing, the engine was detached from the rest of the plane, the plane caught fire after stopping, and both Joyce and her instructor suffered minor injuries but no burns. In January, 1944, Joyce, Marcia and several others were transferred to Liberty Field, Camp Stewart, Hinesville, Georgia, where they trained and flew missions with radio controlled targets. The targets were modified Culver Kaydets, PQ-8's and PQ14's, which were controlled from the copilot seat of a UC-78 or AT-11. They also flew administrative flights taking personnel or equipment from one base to another. In April, the Lois's, Betty, and Emma, were ordered to Biggs AAF in El Paso, Texas, while Joyce, Florence Knight, Mary Nelson, Gertrude Brown, Dorothea Shultz were assigned to March Army Air Base in Riverside, California. 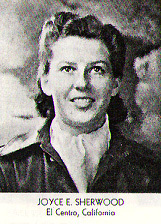 At March, there were about 40 WASP pilots in the Tow Target Squadron. They supported artillery training and radio controlled target planes at several California locations. Most were at Camp Irwin (now Fort Irwin) where they flew off a dry lake bed called Bicycle Lake. Other flights were from a field in Van Nuys where Joyce flew 100 miles out to sea to support RADAR tracking missions. While flying in southern California, Joyce also checked out in a P-63 King Cobra. It was then that she met SSgt. Mario Secciani, who maintained these and other fighter planes. As a fighter, the P-63 was a single seater, so after studying the aircraft manual and getting some advice, Joyce took off on her own and had the thrill of flying that beautiful aircraft. During the month of June, Joyce attended Army Airforce School of Applied Tactics in Orlando, Florida. Unfortunately, there was no flying involved. After the WASP were disbanded on December 20, 1944, Joyce was sad to leave, but proud to have served with this great group of women pilots. In memory of this service, she designed and carved from wood a small statue of a WASP returning from her last long mission. She was in her flight suit with goggles, map in hand, and a parachute slung over here shoulder. The pedestal bore the inscription "Mission Completed". Later in life Joyce learned how to cast bronze copies of the carving. Meanwhile, Joyce got her civilian pilot ratings for single and multi-engine planes, and for commercial and instrument flying. In 1945, she and Mario got married and she found a job with Flabob Flying Service at a small airport in Riverside where she flew charter flights, checked out returning military pilots transitioning from fighters and bombers to the light civilian planes, and helped out in the office and hanger. Soon Mario was discharged and they moved to Chicago for a short time. But with so many military pilots returning to civilian life, she found that flying jobs were hard to come by. After five years, they returned to California and settled in El Cajon, near San Diego, where they built a house and raised two children, Lynn and Lee. When the kids started school, Joyce went to work as secretary to the principal for the school district. It was great having the same schedule as Lynn and Lee. Since then, she has been active in promoting the WASP story. She helped set up the WASP exhibit at the San Diego Aerospace Museum, which was gutted by fire at one point. The museum moved to a new location and a new display was installed. In 1992 she supported an oral history of the WASP by Gail Gutierrez for California State University in Fullerton. Now, May, 2003, she enjoys retirement with Mario, Lynn and Lee, the 5 grandchildren, her garden and her bicycle. Joyce was interviewed for recognition by Congress with the Congressional Gold Medal.